ALERT BABY SITTING IN A BABY CARRIAGE IN OTTAWA, ILLINOIS. This scalloped edged cabinet card captures a baby sitting in a carriage in the studio of J. A. Wilson & August F. Gerding, in Ottawa, Illinois. The attentive baby seems to be intensely surveying the studio. A blanket sits neatly atop the carriage. 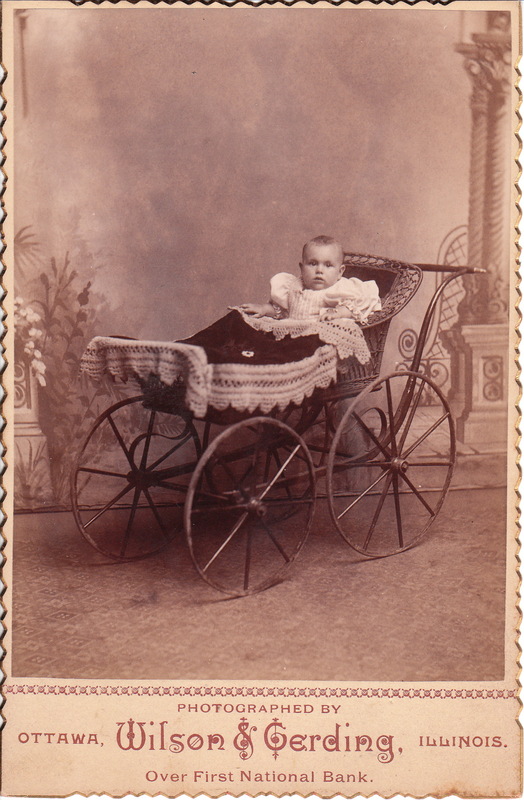 To see a collection of baby carriage cabinet cards, click on the Cabinet Card Gallery’s category “Baby Carriage”.